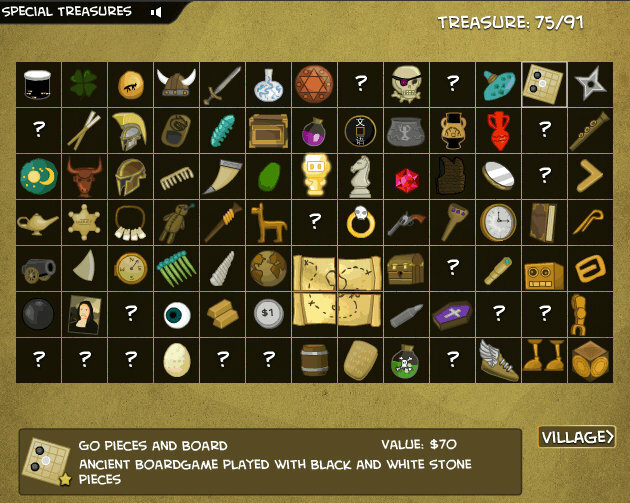 A go board is one of the treasures available for players to dig up in The Legend of the Golden Robot game on Kongregate. Thanks to EJ reader Corey McQuarters for passing this along! (Gamasutra) There’s little doubt that music, literature, and film can all result in some incredibly meaningful works of art, but for whatever reason, the jury’s still out when it comes to games. Veteran game designer, Area/Code co-founder, and Zynga New York creative director Frank Lantz, however, believes wholeheartedly that games can be just as beautiful and meaningful as any other media, and at the 2011 Game Developers Conference, he explained how some of history’s oldest games demonstrate the real power of the medium. But rather than looking at video games, Lantz turned his attention to go and poker, two games that have long since stood the test of time and have proven the power games can hold over their players. By examining what makes these games special, Lantz believes video game designers can have a batter grasp of what makes their craft meaningful. “Understanding this particular kind of beauty is challenging, and it’s important, because if this really is the golden age of games then we, as developers, are its custodians and architects, inventors and guides. And we should understand how these things are beautiful in order to each more people and in order to create deeper, more valuable games,” he said. 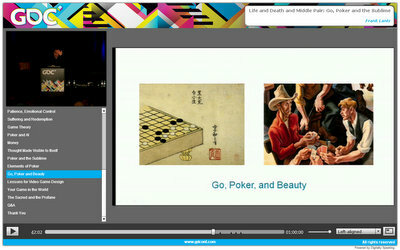 Click here to see Lantz’ lucid and fascinating hour-long talk — which includes a terrific Powerpoint presentation, parts of which are useful as an introduction to the game of go. - from the Gamasutra website; thanks to EJ reader Nick Prince for passing this along. Daniel Chou 6D (center, front row) swept the top Dan division at the October 27 NOVA Pumpkin Classic, undefeated at 4-0. The other first place winners in their divisions were: Kelsey Dyer 1D (3-1), Benjamin Hong 8K (4-0), Anderson Barreal 12K (3-1), and Caroline Scheck 14K (3-1). Second place finishers were Zhiyuan (Edward) Zhang 6D (2-2), Julian Erville 3K (3-1), Dan Hiltgen 5K (3-1), Bob Crites 12K (3-1) and Frederick Bao 13K (2-2). “First and second place winners and everyone going 2-2 got to take home a pumpkin!” reports Tournament Director Gurujeet Khalsa. The 11th World Students Go Oza Championship will be held in Tokyo, from Feb 25 to March 1, 2013. Preliminary rounds will be held on the Pandanet IGS Go Server, and 16 students will be selected to proceed to the championship in Tokyo. Details are on the website for the event. “University/College students under the age of 30 can participate in the preliminary rounds,” says Makoto Moriwaki from Pandanet, “we would like as many students as possible to participate in the internet tournament.” The application deadline is Nov 25th, any questions can be directed to gakusei15league@gmail.com. The entry form is here. -Paul Barchilon, E-J Youth Editor. Photo courtesy of Student Oza website. As a teacher I have seen many go players “plateau” like this. Their common denominator is a fear that they’ve peaked, that they’ve reached their maximum potential and that studying any further will be a waste of time. This usually happens when players are no longer improving naturally, as they tend to do between learning the rules up to around 10k, where just getting advice and playing was enough to steadily improve. The truth is that expecting to go up in rank with little or no effort is like expecting to lose weight without diet and exercise. So when people ask me “I’m stuck, what should I do?” I immediately respond “What are you doing to improve?” And it’s no surprise for me to hear “I watch and play games” as if that alone were an appropriate level of training. My advice: Just do it! If you want to improve you have to be proactive. You have to set goals and perform a more rigorous training regime. Solve life and death problems, read books with the intention of putting in practice the knowledge gained. Take lessons. Remember that people improve at different speeds, but with effort everyone improves. Longtime Portland organizer Peter Freedman has been devoting his efforts towards school programs recently, with notable success. 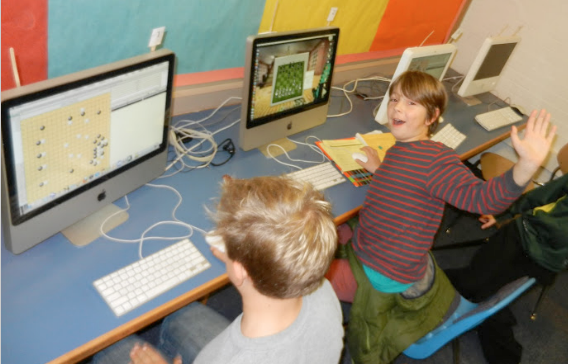 “The photo is from the Irvington Elementary School Chess and Go Club,” writes Freedman, “it has 30 students, in 2nd through 5th grades. The students can, play only chess; play only go; or, switch between chess and go each month. New students must play a month of go before they decide on their option. Go is played on KGS, and a self-pair tournament runs for go each month.” Freedman has also organized live match-ups with Sunstone Montessori, also in Portland, and has his kids competing online with students as far afield as Detroit and Mexico City. Read Freedman’s tips on running a successful program for children here. There are many more helpful links on the AGA’s teaching go page here, and the AGF will provide free equipment for K-12 go programs. -Paul Barchilon, E-J Youth Editor. Photo by Peter Freedman: Jordan (l) and Aden (r) at the Irvington Club. 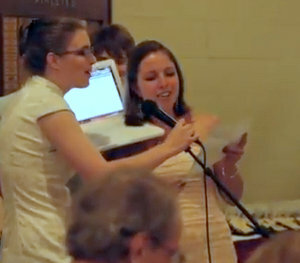 One of the hits at this year’s U.S. Go Congress banquet was the performance of “Tesuji, Maybe” by Karoline Li and Samantha Fede. Sung to the tune of Carly Rae Jepsen’s big hit ‘Call Me Maybe’ with new lyrics by Todd Blatt, the song was one of the winners of the 2012 US Go Congress Song and Poetry Competition. The sound is a bit low, so be sure to turn it up. Video shot by Nikolos Gonzales. Two of the American Go Association’s younger members, Brady (#20162) and Maddie (# 18087) Terpstra battling for ratings. The two are San Diego Go Club President Ted Terpstra (#754)’s grandchildren. 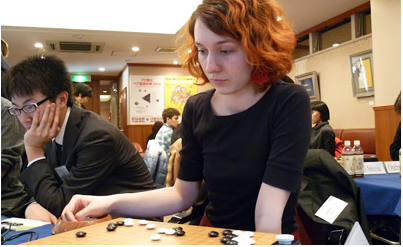 North America has three representatives at international tournaments this weekend: Matthew Burrall and Yongfei Ge at the 7th Korea Prime Minister Cup International Amateur Baduk Championship, and Sarah Yu at the Women’s Bingshen Cup World Championship. The Women’s Bingshen Cup World Championship is an international championship for women, now in it’s third year. It’s being held in Suzhou, China this year from October 28-November 4. 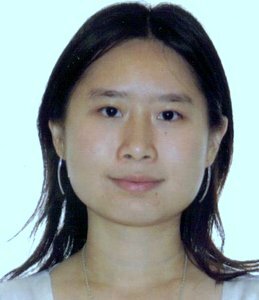 Jin Yu (Sarah) studied go for 6 years in China, where her coach was Ruan Yunsheng 7P. She immigrated to Canada in 2005 and graduated from Queen’s University this spring and is now looking for work. In 2000, Yu placed second in the children’s group the national competition for girls in China and in 2009, she played for Canada in the International Amateur Pair Go in Japan with John Yu. She took bronze for Canada this summer in the World Mind Sports Game women’s individual. The 7th Korea Prime Minister Cup International Amateur Baduk Championship is an international amateur championship hosted this year from October 25-October 30. Matthew Burrall’s dad taught him go when he was four years old, along with his siblings. Soon after, he began to take the kids to the local Davis/Sacramento tournaments and Matthew attended his first Go Congress when he was six. “My oldest sister Kristen and I took to it the most and improved steadily together as we continued to play in local and San Francisco tournaments,” says Burrall. For many years the Burrall kids all attended the Go Camp and the Go Congress every year. “I went with our good friend Jon Boley to Korea for three months to study in the Yang Jae-Ho Dojang,” adds Burrall, and the summer after high school he went to Korea again for a few weeks where he stayed with and was taught by Kim Myung Wan. 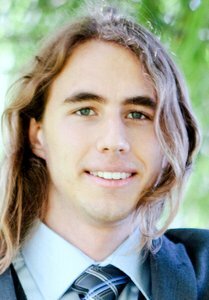 In 2008 he competed in the first World Mind Sports Games in Beijing and Burrall also recently competed in the first AGA-TygemGo Pro Qualifier at this year’s US Go Congress. Yongfei Ge is representing Canada at the KPMC. 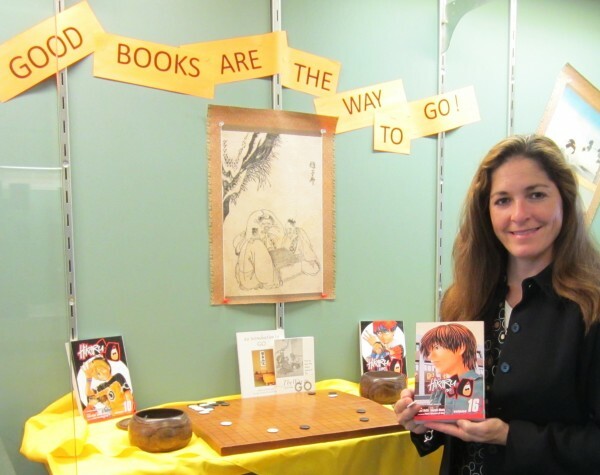 A newly acquired set of the Hikaru no Go manga is on prominent display at the entrance to the high school library in Carlisle, Pennsylvania. “The students were fascinated by the go display,” says Capri Stiles (at right in photo), Carlisle High School librarian. “Expanding the knowledge of the students through authentic experiences is always a great way to promote literacy. The display encouraged students to start the series, and ninth graders who started reading them at one of our middle schools were delighted to be able to access the rest of them here. A playing board and a collection of go magazines really increased the interest in the books.” The American Go Foundation makes the popular manga series available to school and public libraries for free, with just a $20 charge for shipping, click here to order a set. The donation to Carlisle High School was arranged by Fred Baldwin (AGA 8k), a member of the Harrisburg Area Go Club. Baldwin, who is also a long-term member of the Carlisle Area School District board, also arranged for two Carlisle middle school libraries and the local public library to receive their own sets. 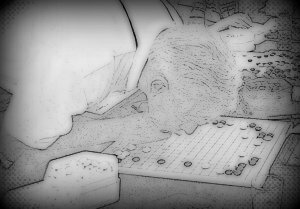 “Several kids at one of our middle schools have developed an interest in go, thanks largely to Hikaru,” Baldwin says, “and two or three of them are regular participants in club play. It’s good to see teenagers learning to love the game and benefit from the mental discipline it requires. I especially appreciate how our school district’s librarians, Ms. Stiles and Stephanie Weimer, have worked with other faculty members to encourage Carlisle students to give go a try.” -Paul Barchilon, E-J Youth Editor. Photo and reporting by Fred Baldwin.